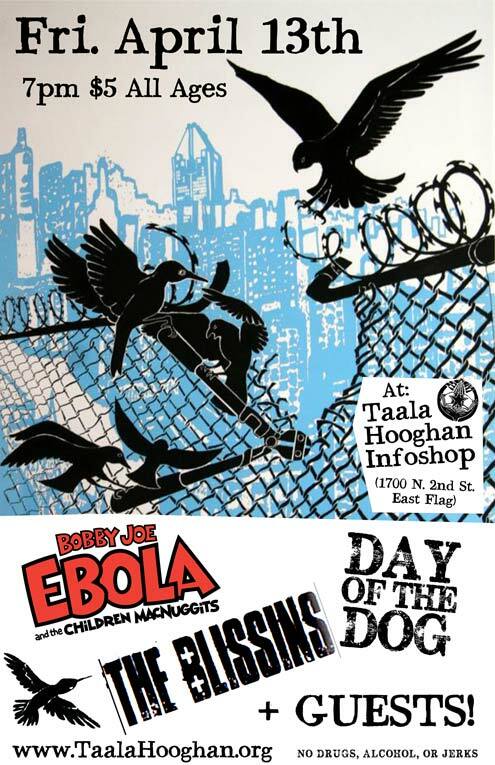 Home » Feature » Taala Hooghan Infoshop Needs Your Support! 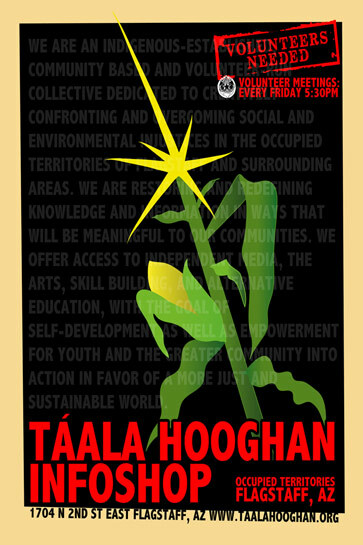 Taala Hooghan Infoshop Needs Your Support! 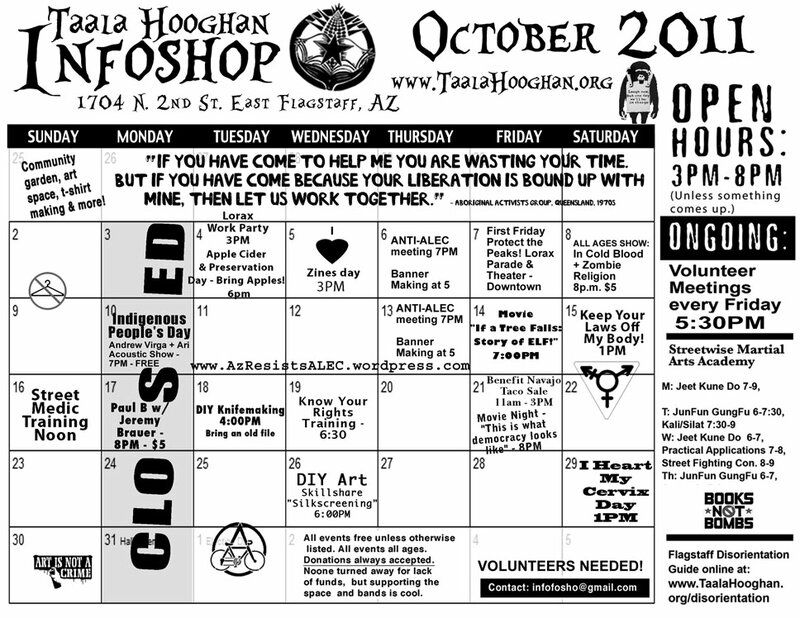 Taala Hooghan Infoshop needs your support to continue providing information, art & action resources, all ages shows, and organizing space! We’re still, and always will be, 100% donation funded, radical, queer-positive, anti-colonial, anti-capitalist, and 100% volunteer-run! While we anticipate Silei Community Empowerment Project to complete making the down payment and the corresponding drop in rent at the end of this year, we also need more collective members to keep our space open! Raising rent and utility funds is always a challenge and we know that from the past 6 years that we can’t do it without your support! By joining the Taala Hooghan’s Monthly Sustainer Program you help in the grassroots fight against ecocide & social injustice. Your monthly financial support enables us to continue our work in the occupied territories of Flagstaff & around Arizona. Monthly sustainers get free access to all our events and special promotional discounts! – Pass the hat, organize a benefit event, set out a change jar, have a yard sale… anything helps! – You can also drop off donations during our regular Friday volunteer meetings at 5:30. Of course, any funds we make beyond rent or utilities goes to important radical community efforts, building repairs, and art supplies! – InfoShop online: We’ve also recently created an Etsy shop @ http://www.etsy.com/shop/Infoshop to distribute information and artwork. All funds go directly back into Táala Hooghan! • Community/Neighborhood Garden! Seeds are in the ground and some small plants are sprouting…there’s still time to get a garden space for you late planters our there. Our collective has some plants and seeds available, and at this moment the garden is 100% grey/rainwater! • The Free Box keeps growing as a community resource! The Flagstaff Family Food Center now directs clothing donations to the Free Box. An amazing amount of clothing and other items pass through on a daily basis. • BEES! We recently had a healthy honeybee hive move into our roof! Currently, a volunteer and another collective member are working on a safe removal process so the bees can provide their important pollination to our neighborhood! • Dharma Punx have started a meditation group every Tues. at 8:15pm. • Táala Hooghan is becoming more of an art studio space for local and regional artists. Young folks with Outta Your Backpack Media (www.oybm.org) have been busy making murals at the infoshop. • As always, we strive to provide a space that confronts racism, sexism, homophobia, transphobia and oppressive actions/behaviors. Additionally–for music, films, discussions and more–we are one of the few places you can find in Flagstaff where events are always all-ages and always drug & alcohol free. 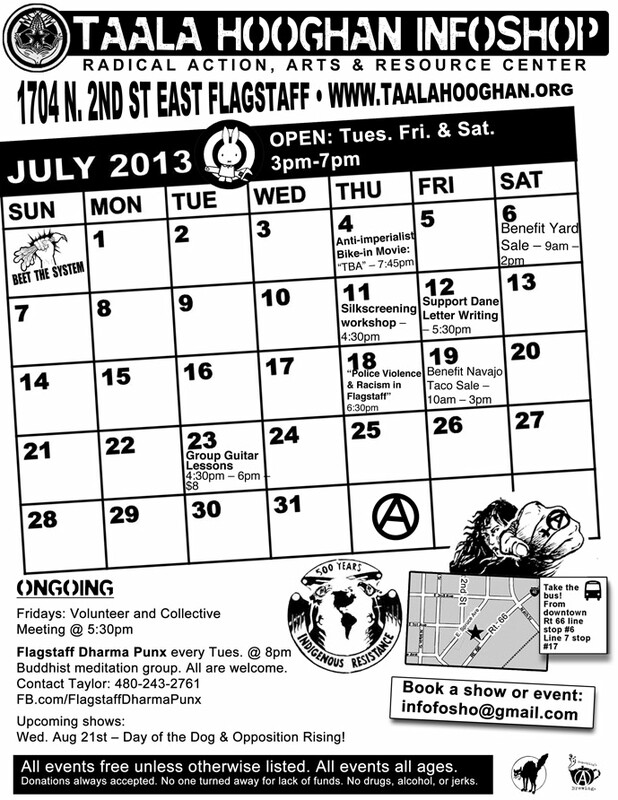 • The Infoshop is actively supporting the reformation of Flagstaff Food Not Bombs and working against AZ and the City of Flagstaff’s racist/colonialist assaults on people experiencing homelessness and houselessness. More info on this coming at the end of the month! Support doesn’t just look like cash, either. We’re looking for volunteers and new collective members to help make this space live up to its potential. Come to volunteer meetings every Friday at 5:30pm, or come by during open hours. Donations of any kind are welcomed, too!